Shane Barefoot of Barefoot Custom Knives made this knife from a piece of angle iron from the World Trade Center. Shane Barefoot of Barefoot Custom Knives is always seeking out ways to craft something unique, something “100-percent Shane,” as he puts it. It was a simple Google search that lead him to a piece of angle iron from the World Trade Center. In the normal course of business trading, the scrap metal from the demolished buildings that was cleared of DNA was sold to China. Understandably, this upset family members of the victims and others. Shane wanted to honor the fallen of 911 by doing what he does best: making knives. He purchased from a company in China. The sacred piece of history arrived–with accompanying verification documentation–and with a bolt in it and two rivets. So, it didn’t take the knifemaker long to decide which direction to take with his creation: a san-mai-constructed blade—damascus steel jacket over a high-carbon core—in the Barefoot hunter pattern. What took a while, was the actual making. Like many knifemakers, Shane always has something around that he’s working on, and the World Trade Center knife was one of those projects. The three steels forge-welded right together, creating a random pattern in the drop-point blade design. The knife is 7 ¾ inches overall, with a 3 ¼-inch blade, hollow-ground using a 12-inch contact wheel. Shane prefers a convex edge on his hunters so that a simple touch-up on a strop is all that is needed for maintenance. The gimping on the thumb rest is in a rope pattern, adding visual interest along with texture. The scales on this knife are made from desert ironwood burl, and the liners are in “toxic green,” making a striking color contrast that fishermen and hunters can appreciate. Shane tests his knives by hunting, fishing and cooking with them; all of his knives are made to be purposeful, to carry out their intended tasks. The ¼-inch pins and the thong tubing are stainless steel. Shane was careful to collect his shavings of the Twin Tower steel, and if anyone wants to buy the knife, he would give those shaving to the new owner. He received one set of documents on the angle steel, so he made copies of the paperwork to prove the legitimacy of the steel’s origin. There is enough left for two more knives. Knifemaking is a journey. Each knife teaches the knifemaker something new. Overall, Shane is happy with how the knife came out, especially how the blued core nested in the damascus jacket is revealed. The only thing he’d like to experiment with is the blade shape. Craig Myles tooled the New York City skyline into the sheath that goes with the knife Shane Barefoot made from a piece of World Trade Center angle iron. Craig Myles tooled the New York City skyline on the leather sheath that accompanies this Barefoot knife. Fittingly, Shane’s friend Craig Myles tooled the New York City skyline into the leather sheath that accompanies this knife. The maker’s list price for the combo is $1000. Although individuals may hold pieces of the World Trade Center buildings privately, there is no longer any left to purchase on the open market, Shane explained, so this is a noteworthy knife. Barefoot Custom Knives specializes in custom pieces for fishermen, hunters and outdoorsmen. You can read more about Shane Barefoot, his dad and his work in the April 2017 edition of BLADE magazine, which is on newsstands now. This knifemaking book includes a chapter on sheaths and what the knifemaker needs to consider when deciding on a particular sheath style. Sure, it’s all about the knife, but knifemakers do well to pick the right sheath for their creation. As the above article on Barefoot Custom Knifes shows, the right sheath can bring excellence to a special knife-sheath combo. Normally, $21.99, “How to Make Knives” by Richard W. Barney and the father of custom knifemaking Robert W. Loveless is now on sale for $12. Erin Healy is the managing editor of BLADE. I purchased the World Trade Center knife from Shane and it’s beautiful! The knife will be for my grandson. I remember the day of the attack and watched in horror as the smoke filled the sky. Burnt litter covered my daughters’ neighborhood as the wind changed direction. I have the COA for the steel Shane used (as well as some shavings) and the COA is not from N.Y.. The attack was in N.Y.. I will always have a place in my heart for the people murdered that day. Thank you so much for sharing this. I’m happy to have the steel issue resolved. I know your grandson will treasure that knife all his life. May he wear it in good health. Thank you, again, for updating us. The tragedy that struck the United States on Sept. 11 2001 was life shattering. Almost 400 first responders lost their life trying to save others. Many of the first responders that did not die, are suffering various forms of cancer and are dying almost weekly. Those terrorist attacks were reason for many young men and woman joined the armed services to protect the U.S. citizens from further attacks. Sadly many of the military have made the ultimate sacrifice in the service of others. Because of the lives lost and the criminality of the those terrorist actions the WTC site, the Pentagon and the airplane in Penn. were declared federal crime scenes. So to recap; in your article you have promoted the sale of evidence from a federal crime scene not once but twice(once when he bought it and once when he is selling it). You have used your circulation power and full force of your media to promote the sale of a knife and bring notoriety to a knife maker. A knife maker who plans to fully capitalize on the events of 9-11 by profiteering from the infamy related to it. The profits are not going to a group or charity that aids the people who suffered on 9-11 or the resulting war. I have been a subscriber to BLADE for 15 years and a reader long before that. I am seriously reconsidering my continuance. Are you so desperate for articles that you would willfully and knowingly promote the profiteering on the horrors of 9-11 and blatantly promote the sale and use of illegal federal evidence. The worst part of this whole story is that you promote it as some kind of honorable or noble patriotic act. There is no sacrifice there is no honor there is nothing but profiteering on the deaths of hundreds and “Blade” so joyfully promotes it..How very sad. Keith: Thank you so much for taking the time to write out your thoughts on this very important subject. Thank you, too, for your public service on that fateful day. I, too, come from a city that has experienced Islamic terrorism firsthand. I do not believe that Shane Barefoot had anything but honoring the victims of 9/11 in his heart when he made his knife. I know, for a fact, that I didn’t have anything but honoring the victims of 9/11 in my heart when I wrote the piece. Mr. Barefoot broke no laws. The wreckage was traded legally to China at the time. And China sold it. Yes, people were upset and yes that was acknowledged in the article, but what better way to memorialize that sacred iron than to make it into something beautiful. There is no right or only way to memorialize a national tragedy. I know from having served in the U.S. Army that people often misstep in how how they honor veterans, but they often have only have the best of intentions. There is not an ounce of profiteering or stolen valor in either Mr. Barefoot’s or my motivations. His hope is that the knife ends up with someone who “really wants it,” someone to whom it will truly mean something. 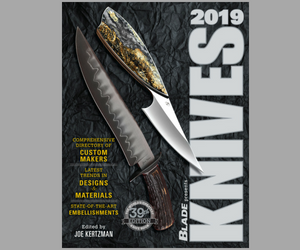 My hope, as always in my writings for BLADE, is to celebrate knives and their makers, report on manufacturers and to support the industry as a whole. It is my firm believe that everyone be allowed to express his or her opinion, just as it is my firm belief that the maker of a knife in memoriam be the one to define its intent, not the critic. Erin.. yes the scrap steel was sold to china. It was sold to china after it was analyzed for DNA traces. The steel was stored at a facility in Staten Island and after it was cleared it was shipped out. So unless it was purchased in a bulk piece from china. Than it was obtained here. If it was obtained here it was part of a federal crime scene until cleared for china. Mr. barefoot stated that he bought the steel from the internet. How does he know it is WTC steel? what verification does he have? If it was sold from the US, than it was labeled evidence in a crime. HOW DO YOU KNOW NO LAWS WERE BROKEN ? I do not think that Mr. Barefoot is a bad person nor do I think you are. But Mr. Barefoot is profiteering from WTC steel if his price is above his regular price for a similar piece. If your child died in a train crash and I made a trophy out of that metal and sold it for profit, how would you feel? I am not stating anything about stolen valor, as far as I know Mr. Barefoot might have served in the military. What I am saying is promoting something as an honorable self giving act when it is not is shameful. If Mr. Barefoot was donating the premium of the sale, I would help promote it. But he is not. So I do not get the selfless sacrifice. Hi Keith: Yes, Shane did purchase it from China, not domestically, and I will update the story to reflect that. He does have certifying documentation for the whole piece, which is mentioned in the story, along with how he copied it for the knife’s future owner. He is not charging any more for this knife than he has for any other custom knife he has made that had a notable story behind it, such as the spent barrel from the gun of an A-10. BLADE has done stories on knives made from Twin Tower steel before, but we would never knowingly promote a knife that had been made from steel that hadn’t been cleared of DNA. I respect your opinion, value your commitment to your fallen brothers and appreciate that I can provide clarification for you and any others who were wondering where the steel came from. However, I stand behind celebrating a beautiful knife, with a finely crafted sheath, knowing that neither Mr. Barefoot nor I did anything in any way disrespectful. In fact, I find the workmanship and care that went into the set to be a way of honoring the people who lost their lives on 9/11 or continue to suffer with the consequences. I also do not begrudge a knifemaker charging a fair price for his work. I don’t believe the story said anything about selfless sacrifice. I will check that, but I do not believe it did. As far as donating proceeds from the sale or a portion of them, that is solely Mr. Blackfoot’s decision. That is not something that we could or would ever suggest. That is not to say that others couldn’t, but that BLADE never would. I spoke to Mr. Barefoot via e-mail. Mr. Barefoot stated that he purchased the steel from someone in N.Y.. I would conclude that someone is lying to someone. Mr. Barefoot is free to do as he pleases. I question Blades motivation behind promoting it. Again, I ask you. If your child died in a horrific crash and I made a trophy from the remaining steel; how would you feel? Well, that is very interesting to hear. When I interviewed him he said China. I will follow up with him and see if a correction is warranted. Again, I, writing for BLADEmag.com as BLADE managing editor, wrote a story about a knifemaker who made a beautiful knife and sheath to commemorate the fallen in 9/11. I don’t believe he did it because he hates America or minimizes the death of the fallen in any way, shape or form. I also personally believe that it’s 100 percent up to the knifemaker whether he or she charges for his or her artwork or decides to donate it. “Trophy” is an utterly wrong word choice. I will follow up with Mr. Barefoot, but you and I will simply have to agree to disagree.